Published by: HarperCollins Children's Books. Official synopsis: "Casper Candlewacks is the only boy with any sense in a village full of idiots… a hilarious debut novel from the funniest new voice in young fiction. But don’t just take our word for it! 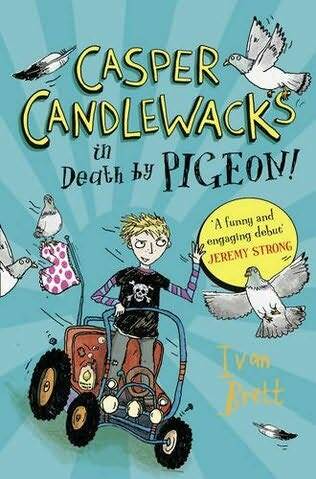 Jeremy Strong has hailed it “a funny and engaging debut”. Most villages have an idiot but Casper's village is full of them. So being bright makes poor Casper something of an outsider. When famous magician the Great Tiramisu curses the village, Casper's father is blamed and sentenced to death by pigeon. It's up to Casper and his best friend to find the magician, reverse the curse and save the day. A riotous tale that proves all you really need in life is a buggy that runs on washing-up liquid and a couple of boys to crash it." Set in the fictional village of Corne-On-The-Kobb which is jam-packed full of idiots. Aimed primarily at a younger audience, the book says 9+ on the back (hey, so I'm only 10 years out then not too bad... 11 next week but who's counting?!) but I found it to be an entertaining and hilarious little read, from an exciting new author. It all begins when the Great Tiramisu pays the village a visit and in a heated moment, Casper does something he later comes to regret. Soon we find Casper the hero as he must save the day, and ultimately his dad, from killer, human-flesh craving pigeons! It's fast paced so sure to capture the attention of even the most reluctant of readers. Well not much longer to wait. The second book The Claws of Crime is out on 5th January! Excellent! And with a third book, Attack of the Brainiacs! due next April as well, 2012 looks set to be a good year for both Casper and Ivan!